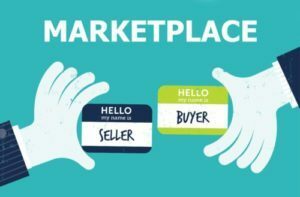 So, what is a marketplace? An online marketplace is a website where products and services are sold by multiple third party suppliers. The operator of the marketplace, the person who controls the site, is responsible for facilitating the transactions that occur through the online marketplace. This includes making payments to their suppliers and providing services through the marketplace. The operator of the marketplace does not own any inventory; their business is to present other supplier’s inventory to other users and facilitate transactions. They make money by taking a service fee or a commission percentage from each transaction or through subscription models. Amazon and eBay are excellent examples of popular online marketplaces. Airbnb, Uber, Upwork, Angie’s List – yep, those are marketplaces too. Over the last several years the number of marketplaces has exploded, which isn’t a surprise because they offer real convenience to consumers. If you were creating a department store in 2017, it would likely be an online marketplace. Since multiple suppliers are able to reside under one marketplace, there is a much broader assortment of products and services than any traditional brick and mortar store could offer. Research has shown that consumers don’t typically like shopping from single retailer websites or apps. They are more likely to shop on sites like Amazon, because they’re able to offer product ranges broader than a single store could ever dream of. An online marketplace serves as a one-stop shop for online consumers who are looking to save time and effort when shopping for products and/or services. Marketplaces are attractive businesses to entrepreneurs because they are very scalable. They don’t require a high upfront cost to develop and launch a Minimum Viable Product (MVP) since the marketplace owner doesn’t need to own any of the inventory. Think about it: Uber and Lyft don’t actually own any vehicles and Airbnb doesn’t own any hotel rooms – they simply offer a platform for suppliers to offer their services. A marketplace business model reduces a lot of the initial risk that entrepreneurs typically face when starting a new business. What Types Of Marketplaces Are There? The industries that an online marketplace may focus on can vary widely – from products, to services to rentals. Some are for general shopping while others are catered towards specific niche markets like antiques, electronics, automotive etc. Etsy is an example of a product marketplace where vendors can sell their unique handmade goods. There are an increasing number of services that specialize in certain aspects, like pet-sitting, tutoring, web design, etc, which allows for greater variety and depth of offering. Care.com, Rover and Fiverr are some examples of popular service marketplaces that many consumers use on a regular basis. Service marketplaces are on the rise because they eliminate the biggest pain points customers have when hiring for services: researching, vetting, contracting and transacting. All of that can be done on an online marketplace. The trend of ‘renting over buying’ has increased the number of niche-based online rental marketplaces for vehicles, dresses, lodging, travel gear, etc. The tech-savvy, travel-enthusiast, millennial generation is more likely to rent things instead of buying as a more practical and cost effective way to use resources. This is why sites like Rent the Runway and Airbnb are so popular and successful. What do all marketplaces have in common? The true beauty of marketplaces is their ability to create a collaborative economic community by connecting buyers and sellers. The marketplace owner’s success is dependant on whether there are enough suppliers using the marketplace and whether they’re making steady sales. The suppliers’ success is dependant upon the marketplace owner’s efforts in marketing, site maintenance and constantly assessing and improving the user experience on their marketplace to appeal to potential buyers. A well-designed marketplace that is easy to use, with plenty of suppliers and inventory to choose from gives buyers a convenient shopping experience. Before Uber, Lyft and Airbnb, the idea of getting into a stranger’s car for a ride to the airport or booking someone’s bedroom for the night was just plain weird. Today, our night out at the bars and vacations are centered around the convenience that these services offer. They’re not only convenient to the consumer, but also to the service providers who depend on the income they earn by offering these services. These popular marketplaces created the sharing economy and changed the world. That’s the power of marketplaces. Despite all the attractive benefits of owning a marketplace, building a successful one is not easy. Eventually, all online marketplaces will all have to prove their staying power by offering efficiency and unique value to consumers. Those that can’t will wind up losing market share the way department stores are now, and eventually those marketplaces will disappear. Those that can survive and compete effectively against Amazon or other marketplace powerhouses will continue to create value and profitability. If you’ve been obsessing over a lingering idea or have a solution to a common problem, are driven, patient, ambitious and have basic business acumen, you might want to consider starting your very own online marketplace. According to a study by PwC on the global market size of the marketplace economy, the size of the industry is currently at around $15 billion, and expected to grow to $335 billion by 2025. There really is no better time than now to become a marketplace entrepreneur! Provided useful information regarding online marketplace. Thankyou very much for sharing.